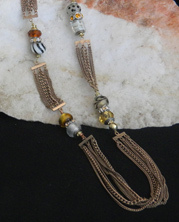 Unique, handmade chain and metal bead necklace designs are accented with glass beads, natural stones and pendants, creating beautiful statement jewelry. 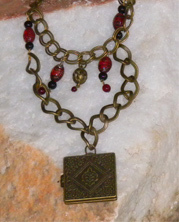 Vintage look square hinged locket on curb chain with red bead accents. 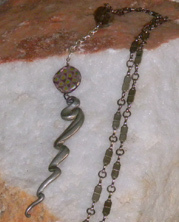 Three charms dangle from a sparkly barrel bead pendant on a multi-strand chain. 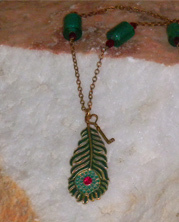 Teal peacock feather pendant and accent beads on a delicate chain. 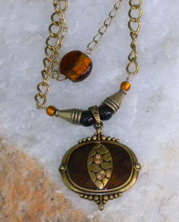 Tribal animal skin amber pendant and beads. 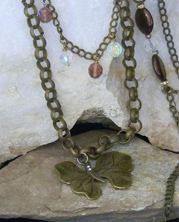 Deep textured heart of bronze colored metal hangs below a dainty bronze butterfly and leaves. 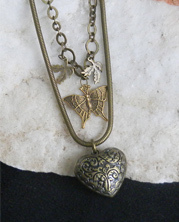 Charming stylized bronze butterfly pendant with bronze and glass beads on a cable chain. 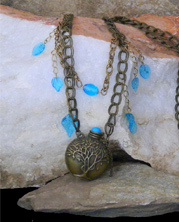 Earthy tree-vial pendant on a chunky chain with translucent turquoise-glass leaf accents. 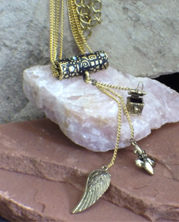 Intricate chain ensemble features decorator bead accents set between each section - to dress up or down! 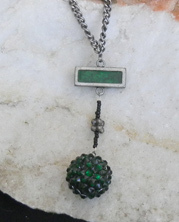 Sparkly green ball and industrial rectangle dangle from a chain accented with green iridescent glass beads. 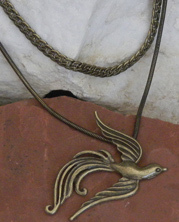 Elegant phoenix bird in flight on a rope chain, matched with companion serpentine chain.